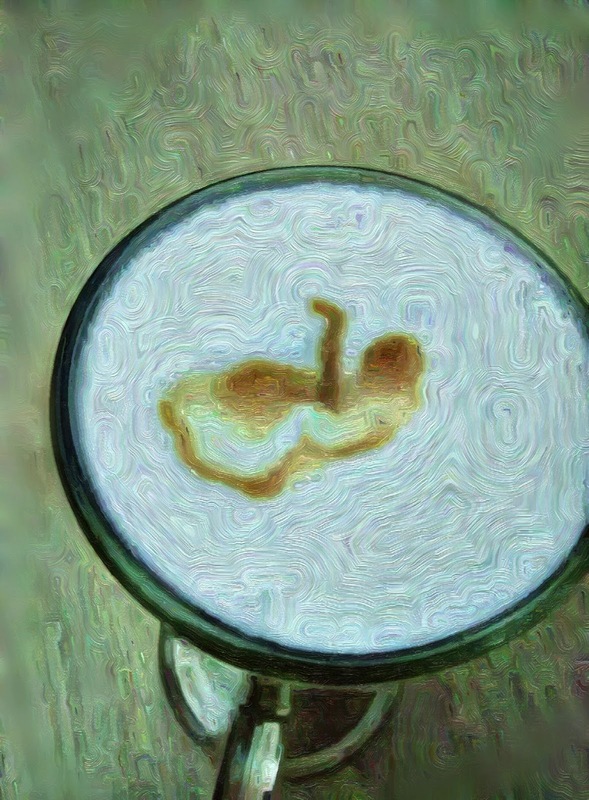 So above... Today a café latte, and what appeared to be a little wriggly apple on the top, then I had a little play with the photo! All done a little too quickly as I suddenly realised the week had run away with me! I have been very busy this week, at work, and out of it... I can't believe how much 'stuff' I am passing on, clearing cleansing, sorting, I have never done this before, things I have held onto for nearly all my life... Letters, broken things, junk, and then to add to my things, my moms things, although I really only kept her favourite things, which are exactly the same as my favourite things!!! So, bric a brac!! I also bought 100 plastic sleeves which hold 8 photos, absurdly thinking these would accommodate my photo collection, so today, came back from work, spent a few hours getting rid of a headache and filled the 100 sleeves... I still have three quarters of the photos not in sleeves!! Guess this means I will have to buy two more lots!!! Thankfully the fourteen thousand photos taken digitally live in cyber space! So funny the other day, I was sat here in on sofa the land line rang, I reached over the back of the sofa to the windowsill and the phone, knocked it off the sill, it dropped down behind the back of the sofa, I shouted "sorry, dropped the phone, hang on..." Reached down, really had trouble grabbing it, until finally managed to grip the phone... And couldn't get my arm back out!!! I had to force my arm along between the sofa back and the window sills edge, until I reached the wall and could pull my arm up with the phone still in hand!! No one there by then!! Unsurprisingly!! For a moment I thought I would have to just stay there trapped by my arm!! O&OE (written on my phone, and unable to actually see the whole page!! Lol).